I picked up Benjamin Anastas’ memoir Too Good To Be True to read about his particular version of how a writer can fail in this day and age. Because failure is very simple: your book either doesn’t sell to an editor, or even if you do get a publisher, the sales are poor and there goes your career. Which is what happened to Anastas except it happened after he’d had a bite of the literary life gone right: graduating from Iowa’s prestigious writing program, signing with good literary agent, getting a three book deal, getting critical acclaim, getting invited to the right parties, contributing to the right journals, being feted and then feted again. Until of course you stop making money and suddenly your agent is not answering your calls and your publisher doesn’t remember you at all. But Too Good To Be True is much more than simply a writer’s nightmare. Anastas writes about his debt ridden existence, his affair, his wife’s affair, their son whom his wife allows to be someone else’s son, and underlying all this, growing up in a time when parents forget that they were the adults, that is the sixties and seventies. 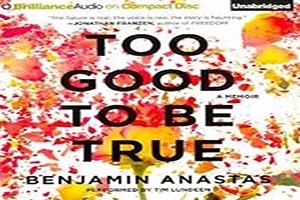 My favorite chapter is the eponymous Too Good To Be True when Anastas relates the time he and his three year old twin sister, their seven year old elder brother and their mother spent a summer in a residential group therapy program called Freedom To Be. Anastas seemed trapped by the memories of that time, especially the trauma of the sign hung around his neck ‘Too Good To Be True’. His sister’s said ‘Crybaby’. And his brother’s ‘Mr. Know. It All.’ This is a beautifully written and tender chapter and Anastas’ stark candidness, refreshing throughout the memoir, is here gut wrenching as the reader imagines what these three little kids must have been through psychologically. However the chapter that blew me away, by far, is ‘Old Friends’. For this chapter alone, please read this memoir. ‘Old Friends’ is a beautiful meditation on a parent/child, father/son, writer to writer relationship rolled into one. Anastas’ father also wrote fiction and, forty years after having written it, sent him a story called ‘Old Friends’. Till he sent it, in fact, his father even says he’d forgotten about the story, that the story had lain in a box with the divorce decree. I remember that oak tree where we mobbed my mother that day. Where we held onto her so tightly– all of us– because we wanted her to feel better about the garden, we wanted her to live. But we also held onto her for selfish reasons, to feel safe from the dangers that were closing in around our family. If we could just hold her under the oak tree long enough, pin her there with our arms and legs, then maybe disaster would never reach us. I used to go back to that oak tree without knowing why. I had never read my father’s story. I didn’t remember the garden and my mother’s tears. It was an old pain. It was ancient already. To read your life on paper written by your parent, except it’s not your parent only, that is that parent is also a writer, and it’s not really about you, it’s fiction after all, after all it’s fiction, how strange, disconcerting, amazing and awesome reading something like this must be. I can only imagine perhaps forty years from now Anastas’ son reading his father’s memoir, that is his own life, in the same vein. Perhaps Anastas’ son will write a memoir too. Too Good To Be True doesn’t give any new insight on the publishing industry that most writers aren’t aware of: when you’re up, you’re up, and when you’re down, you’re fucked. (unless of course you happen to write another book that breaks out and then you’re up again). But then it’s more than simply a memoir of a writer who was once up and then learned what it mean to be down: Too Good Be True is a story about, up or down, how to go on.